Plan Philly reports that Philadelphia's lucrative Street Furniture plan has not received any serious bids and has been scaled down, eliminating any of the niceties that were to be included such as bike parking shelters. Instead the city will be draw up a new Request For Proposals to upgrade the maintainance of the existing bus shelters over the short term-anywhere from one to four years and work to draw up a new contract when and if the economy improves to a point where it may become feasible. If there is a silver lining here it's that The Street Furniture contract did not include bike sharing and the contract could have been locked in for a long time. With several peer cities starting up bike share programs the economics and practicality of bike sharing should be well documented by the time Street Furniture v.2 is put out to bid. That is of course if we haven't found another way to implement it by then. 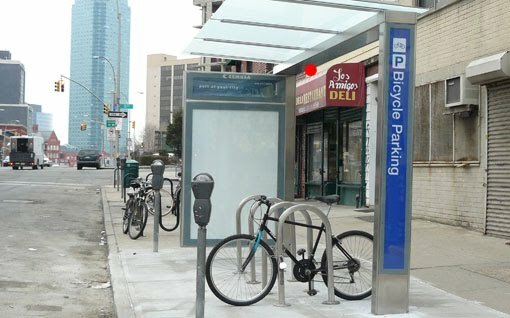 Bike Shelters, not coming to a street corner near you. Innovations in this city- "Slipping Away" Steel Wheels 1989. Like these songs and the Stones, it is all getting old!